So what was the story in 2009? How did it unfold? Now we bring you the account of the Eleventh day of this sublime divine odyssey. The Day Eleven of Kodai 2009 was the penultimate day and by this time the students had gone through the regular must-do items like ride through the town, boat club, horse riding, shopping and so on. However, in terms of visits to the houses of devotees, there were still two left, and this was the day to take care of that. Thus, the morning darshan was quickly gone through, and before we proceed to narrate what happened next, here is a short clip of the morning bhajans. After the morning darshan, everyone piled into the fleet of vehicles lined up to take them to the house of the devotee whom Swami would be blessing that morning. And that blessed person was Mr. V. Srinivasan. Earlier we have had occasion not only to narrate about how Swami went to Mr. Srinivasan’s house way back in 1981, and how in a sense it started off the second round of Swami’s Kodai trips, which later expanded to include big student groups. 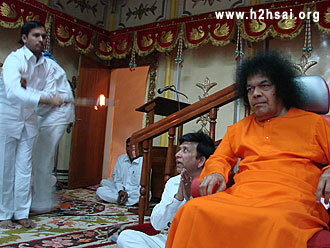 We also told you about how Mr. Srinivasan did a lot of work behind the scenes, tirelessly, to bring Swami to Kodai. Not merely that, he was there every single day, making sure everything went the way it ought to from sunrise to much after Swami retired, for it was he who, before he drove back to his residence at night, made sure all was set for the following morning. While Mr. Srinivasan was very visible in getting many of the things organised, there were a few ladies who were hardly visible, who essentially managed Swami’s kitchen. As we hinted on a few occasions, Swami always eats very little. And these ladies did all they could to ensure that what little He ate was exactly according to what His preferences were. One of those most silent workers was Mrs. Srinivasan, and one might even say that it was in response to her silent prayers that Swami chose to Grace their house with a visit, which by the way, He unfailingly has done many times over the years. The house where Mr. Srinivasan lives is over a hundred years old and some distance away from the lakeside. It is located in a nice elevated plot overlooking a small valley, and is slightly secluded. By the side of the original house is the one that was specially built for Swami to stay during His Kodai visits, and this in fact He did till up to 1987 when Swami sprang a surprise on Mr. Srinivasan by moving into Sai Sruthi, which till then He was saying was being built as a Guest House for Rajmata of Navanagar to stay! And facing these two buildings is a small piece of lawn and that is where Swami usually spent some time with the boys and the invited guests before going inside for lunch. It was the same routine in 2009 too. However, before all that happened, as soon as Swami’s car entered the premises, Bhagavan was welcomed with much love and devotion by all members of the family present, and needless to say in the traditional manner. 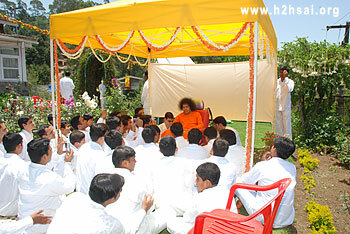 It was only then that Swami went to the small but tastefully done shaded section at one end and took His seat to give darshan, while all the boys sat near Him, trying to catch every word of His and of course taking all the pictures they could. Meanwhile, some people went close to Swami not only to offer pranaams but also have a word or two, seeking advice, comfort, and blessings. Some who had been through this experience earlier, took a moment or two off to walk to the edge of the property and take in the wonderful scene, and the beautiful sunshine that was available in plenty. Those who have read the narration of Day Two of this series might remember Mr. Narasimha Murthy recalling that way back in the early 80s Swami used to give discourses on that very spot! Soon it was time to move on, and Swami Himself gave the signal by indicating His intention to going inside for the lunch session to begin. The moment Swami hinted it would be lunch next, all the family members crowded round Bhagavan and with much love led Him to the main hall in the house where a table had been specially laid out for Him, as always. No one else from Swami’s party was in the room and this way Swami gave Himself exclusively to a family that had served Him with deep devotion and sincerity for decades, in many different ways. Since the group that Swami had taken with Him was big, the rest of the party had to be spread out, and thus it was while a handful of elders were seated for lunch in the main building, all the rest, that is to say primarily the students, were served lunch in the adjacent building that might truly be called Swami’s building not only for the reason it was built specially for Swami to stay but also because that exactly is where He actually stayed almost every year till Sai Sruthi came up. The lunch was, as always, wonderful. And after that sumptuous lunch, it is doubtful if anyone was prepared for what was to come later. What happened was after giving the stomach barely a couple of hours to do a duty that needed extra hours, the Vaishwanara or the God of digestion, with hardly any notice was given another sudden and emergency duty! What it means is that Swami asked everyone to get ready for a ride all the way to the top of the mountains, to the house of late Mr. Naidu, known to all simply as ‘Coimbatore Naidu’. 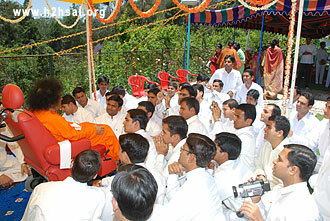 It was He who had managed Swami’s visit to Kodai in 2003, which came after a few years break. On that occasion, while Swami went to Kodai via Madurai flying in from Bangalore, the return trip was done via Coimbatore, just in order to give Mr. Naidu the joy of receiving Swami in his residence there. 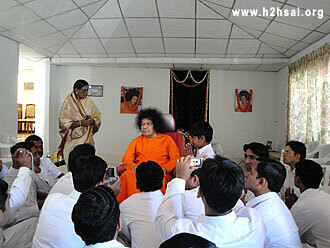 In 2007 too, Swami returned via Coimbatore. 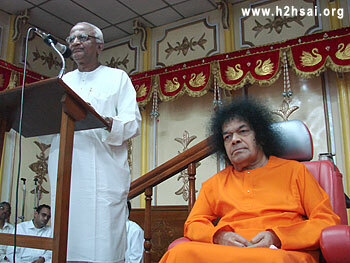 By that time, Mr. Naidu was not doing too well, and that was part of the reason for Swami to go to Coimbatore; also, he wanted to call on Mr. Sachinandam, now alas no more, whose devotion to and faith in Swami was beyond belief! 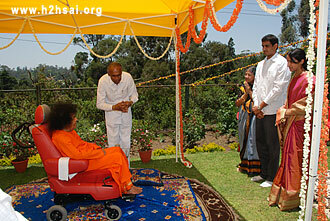 As a result of medical complications, Mr. Naidu passed away, but his family had come to Kodai to have Swami’s darshan. 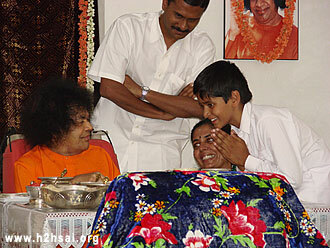 And so, just to give some comfort and happiness to the family, Swami took everyone to their house, which, by the way, is close to the TV tower that can be seen from Sai Sruthi, directly in front of it, across the lake of course. The Naidu family is second to none in extending hospitality, which in practical terms meant of course providing goodies to eat. Swami of course ate very little – He is a master at that, and makes sure the hosts do not notice that by engaging them in most endearing conversation; in any event, that is why He goes to the houses of devotees - to give them joy. When the party returned after visiting the family of late Mr. Naidu, it was time for bhajans, which was sort of overdue one might say. 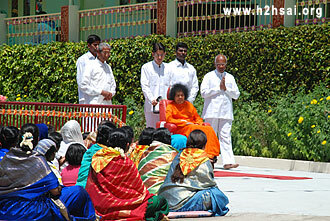 A big crowd was waiting, especially since Swami was to depart the following morning. Swami came out quickly, and bhajans started. Soon they were stopped and Swami signalled to Mr. Narasimha Murthy to give a talk. 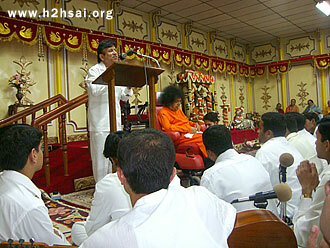 That was a nice talk capturing the glory of Swami’s limitless compassion. This was followed by another inspiring talk by Mr. Ajit Popat. After this, arathi was performed and the curtains came down on the last but one day of Kodai 2009. 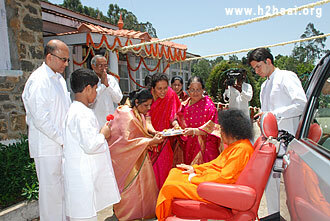 In the next episode we will offer you the moving story of the last day of this divine Kodai odyssey in April-May 2009.